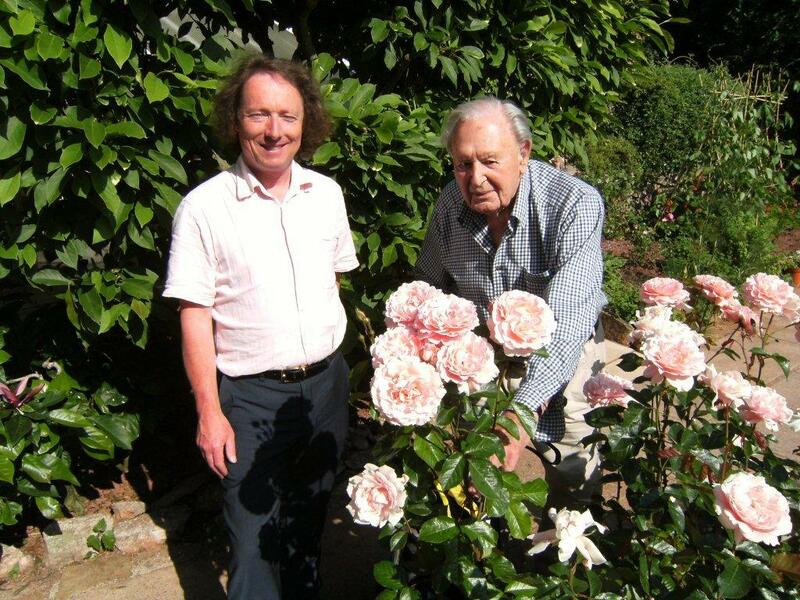 On a glorious evening in late June I was invited to visit Topline Broadhurst's garden in Torquay where his renowned Rose Garden was at its absolute best.Topline has been growing roses and perfecting their maintenance for several decades now. He was one of the original gardening presenters on a West Country TV station in the 70's & 80s where he imparted his knowledge on a weekly basis and was also a contributor to a national newspaper column. Bathed in the warm evening sunshine whilst sitting on his patio one was able to take in the stunning beauty of the roses as well as their fragrance wafting across the garden. As we took a tour he passed on several useful tips gained from years of experience whilst talking about his favourites.He highlighted the benefits of cultivating good quality leaves which give strength to the rose together with feeding potash in August & other feeds during the year. Aphids & other pests can be kept away naturally by allowing ladybirds & lacewings to thrive near the roses. I asked Topline to name his favourite roses.Samaritan was one and Margaret Merrill was the other both having a wonderful fragrance - his key criterion for passing the Topline test ! Both these roses can be found at reputable garden centres or on the internet. As I finished my Gin & Tonic and the time came to leave I felt most uplifted but also challenged to have a go at growing some roses myself. Topline gives his August/September tips for getting the best from your roses. "At this time of year roses should not be given any more Nitrogen based fertiliser the reason being that if applied now Nitrogen will give soft sappy growth which is likely to be badly affected by autumn frosts. Instead apply Potash and do so before the end of September.After that wait until late February so it is not worked away by the winter rains being soluble like salt in water.Potash has several advantages for roses.Firstly it ripens new wood for next year's flowers but it also helps fight disease and as a bonus gives better colour - more important as a fertiliser than a Spring application of Blood Fish & Bone ! 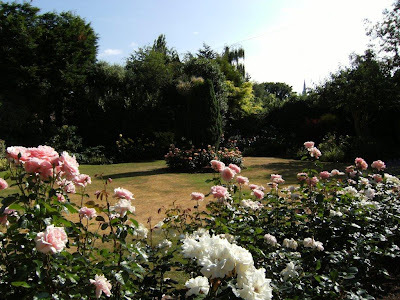 If you have a rosebed that needs some extra height you would probably consider a standard rose but the trouble is that they are so expensive these days.There is however a cheaper alternative which is to grow a climbing rose on a "Tripod". you will probably find some climbing roses perhaps even reduced in price at your local garden centre but certainly much cheaper than standard roses.Plant three good stakes as the tripod and train the climbing roses as horizontally as possible going round and round the tripod.In this way the climber will be encouraged to make vertical growth from the buds on the main stems.The result will be that you will have masses of flowers on ths new growth in 2011. A good money saving tip ! " November is the perfect time to plant roses - one reason being the availability of bare root plants which can often be bought for 50% of the price of container roses.Dig a large hole fill with compost and some blood fish & bone mix but keep clear of the bare roots.If you have any questions regarding roses e mail them for the attention of our rose expert Topline Broadhurst who has 60 years experience of growing roses !